I want to be initiated in Quimbanda, how do I proceed with that? When we speak of initiation in the perspective of Quimbanda we are speaking of a true and intense merging with spirit that involves a pact/agreement, a spirit vessel (assentamento), ordeal and oath. There are elements used in this process that are common to every house/terreiro/cabula/lineage of Quimbanda that reveals a common origin. There are different varieties of Quimbanda in Brazil, and the expression of the common root, will always depend of the constellation of spirits we find in the tronco. 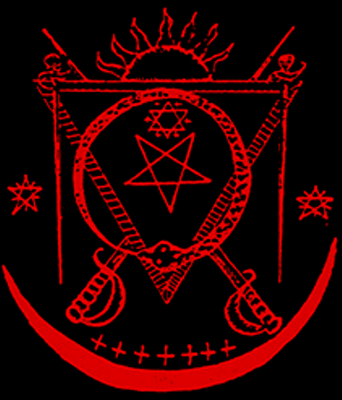 In other words, a ‘Casa de Exu’ that is dominated by Exu Mor, Exu Morcego and Pomba Gira Maria Padilha will most likely express itself differently from a ‘Casa de Exu’ where we find Exu Lucifer, Exu Tranca Ruas and Pomba Gira Cigana taking dominant positions. In addition we have the issue of pedigree and also the orientation of the people involved that generates an even deeper nuance of the specific house coloured by the human factor. It is in this field we find the frequent quarrels and disagreement between houses typically mediated by ‘truth-holding’ that is imposed on those that do things in different ways. We need to keep in mind that we are, when speaking about Quimbanda, dealing with a ‘living tradition’, which means that we are dealing we actual spirits, souls and intelligences that we interact with and that influences us as we influences them. This means that at the end of the day what matters is the connection with spirit being true – and this is revealed in the capacity of the practitioner to merge with his or her Exu or Pomba Gira – in a truthful way. Initiation, or to have your Exus and Pomba Giras fully seated and be made Tata/Yaya at the feet of the Maioral is for the majority of people pointless, a charge to heavy, a burden that overcomes the vessel and so Quimbanda should not be perceived as a hierarchical ladder, but as a cult design to facilitate communion with spirit and enhance your natural mago-spiritual power, self-understanding and understanding of your spirit mirror that you find amidst your Exus and Pomba Giras. This means that for most people a solitary and personal practice focused on communion with one’s personal spirits will be sufficient. What we have done in the case of our Cabula is to isolate some parts of the full cycle of seating spirit and turned this into a ‘Quimbanda baptism’ (massange), where the candidate is going through ritual steps that fortifies the bond with ones ancestors, the kingdom of the Cruzeiro (roughly the Quimbanda ancestors ruled by Exu Omolu) and is exposed for ritual actions that are basically a baptism of fire both by ‘fiery waters’ and fire itself. Going through this ceremony we deem the person a Quimbandeiro proper at this is in truth as far as need to be going on this path for the majority of people. The divide is between those who are destined to guide themselves and those who are destined to also guide others. For those destined to guide others, lay down in anticipation of death at the feet of Exu Mor, might be the road to take, but for most, it is really not necessary. Can I purchase a guia, patuá or statue even if I am not initiated? Guias, patuás and statues are charged objects that hold the virtues of particular spirits. In my case I do offer these items quite freely for whoever is in need of them, expecting that some discernment and consideration has led the person to seek to acquire an object of power. In the past I was far more restrictive with these power objects, but in questioning myself to what extent I was my brother (or sisters) keeper, I decided to make this option more open and less restrictive for those in need. This is partly rooted in the realisation that we are dealing with living spirits capable of guiding us in ways as mysterious as the ways of whatever god. A guia is a specially prepared necklace. It is made under ritual circumstances in such way that the process of beading is made with the attending spirit present. Then the guia is washed and left with the Exu/Pomba Gira it is made to attract for three nights. In this process the guia is then turned into holding the virtues of the spirit guide and can be used in ceremony or when situations of guidance in the world are desired. A patuá is holding a similar direction as the guia, but with the addition of more materia magica that typically gives it a more solid rooting in a given kingdom linked to beast, mineral and herbs of a specific virtue and attraction that turns the patuá into a charm linked both to spirit and kingdom that should be carried on the body when need be and when not in use be left in the firmeza or tronco. In the case of guias and patuás it is good to offer them cigar fumes and spray them with strong alcohol from time to time to maintain their vigor and attention. Statues are the most dramatic access point to spirit we offer to the general public. Our statues are charged, washed and crossed and in practice it means that they are filled with what would go into a patuá as well as other secret ingredients connecting the particular Exu or Pomba Gira to the charge. They are then washed in herbs and are presented for offerings to invite in the spirit to be naturally attracted to its magically embedded form. This means that these items provide access to spirit in a personal way and can constitute a personal firmeza or shrine dedicated to one’s personal spirits. If we accept the premise that we are here dealing with daimonic spirits that are naturally inclined and tied to us in unique and mysterious ways there is really no need for initiation as such to work with them as our personal Exus and Pomba Giras will behave in a way similar to our ancestors, namely in being tied to us by natural affinity and in this opens for direct access. How should I work with Exu and Pomba Gira? The Exus and Pomba Giras are nocturnal spirits, so we will always work them after dark and all tools of power should be held away from direct sunlight. Friday, Saturday and Monday are the nights when they are most commonly worked in Brazil and working on these nights will enable you to tap into periods when they are naturally more active and agitated. Even if certain nights is considered more auspicious for Pomba Gira and others for Exu it is perfectly fine to tend to them both on the same day and if one day should be chosen as being preferred it would be Friday. Friday night is the natural night of joy in the world. The work week is over and the leisure and spirit of feasting enters the world and generate a natural bond with the spirits of Quimbanda. Offerings of cigars, cigarillos, red wine, absinth, whiskey, cognac, cachaça and vodka are all good and in its most simple form a glass is served to the brim with a lit cigar crossing the glass in front of the image. Pontos are sung and as the atmosphere shifts direct communion takes place ruled by the interaction between man and spirit. Simple offerings of beef and peppers can be given to Exu as seven thornless roses can be given to Pomba Gira. Candles, red and black is offered and allowed to burn out by themselves and offerings are dispatched of after one or three nights in front of spirit either on the ground or at a crossroad. Why is Exu and Pomba Gira presented in diabolic forms? We should keep in mind that Exu and Pomba Gira is commonly referred to as guia or guide and it is in inviting them in as guides we make the greatest work with them and will see natural positive effects in our lives. This means that they are first and foremost teaching spirits and they teach often by challenge and ordeal, which is quite obvious if we pay attention to the accounts of human incarnations they tell us. Their stories are always about struggle and misery, abuse and injustice. It is about the all too human response to challenges, such as anger, vengeance, gossip, deception, hatred, violence, murder and whatnot – and so these spirits in being vice itself – is also giving us the option of seeing ourselves in this ugly mirror they hold up to us so we can see in our Exu and Pomba Gira the same challenges they had as we have and in this they try to teach us not to do what they once did – but instead choose the better way, the way of laughter, serenity and joy of accomplishments. For some the diabolic features of these spirits and their attachment to the darker strains of life evoke the idea that these spirits are prone to violence, murder and negative spellcraft. Due to their deep understanding of matters human they are able to assist in such undertakings, but we should also keep in mind that the very word Quimbanda is actually a kimbundo substantive, defining a person who heals with the help of spirit, and certainly if we look at the area of healing from an amoral and value free perspective the act of removing or murdering something in order to maintain health is a part of the design not different from the annihilation of virus and bacteria in order to maintain the health of an organism. Yet at the end of the day we are speaking of a cult of spirits with great healing properties that are natural guides in the human journey. The diabolic imagery serves to remind us that every saint has a past, every sinner a future and that wickedness can be easily tempted out, hence they serve as guardians of the crossroad of choice and present themselves as both guides of goodness and devils of destruction and in this they sum up the human constitution. For the full range of products offered by Sacred Alchemy Store, please visit us by a click on the link.